I'm a big supporter of the merge between QA/Testing and Audit, and I have greatly appreciated the updates you have made to the Maintenance page. There is still a missing gap for the Customize/Install/Tweaks page (which you have mentioned you will working on next) but for now I don't have a place in my d7III package for many of my custom installers. Can you add another custom field to the Tweaks page where I'll place my unattended installers? Tweaks and all OOBE related applications could be on the same page. 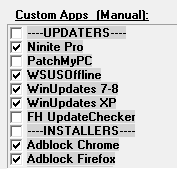 My installers go in the Manaul column of Maintenance in my setup. I preface them with an otherwise-empty config called "---INSTALLERS---". Not sure why you'd run an installer automatically but you could also put the same entry into the Auto section and run silent installs there. Any update on this? The "Tweaks" page should be renamed to "Customize" and a box for installers should be included. I really miss a place to put these things. I noticed many people only put automatic applications in d7II, but I put EVERYTHING in d7II whether or not it's automatic. It's just a really convenient location to keep everything. When a page for installers was removed, I imagined there would be a large upset on these forums, and it would take 48 hours MAXIMUM to get this put back in. It was a very clear mistake to remove it. Obviously there wasn't the upset I was expecting from the other users, but straight up I HATE that this page was removed. Makes no sense; PUT IT BACK. What possible logic could there be to remove this page? Why dont we have instead of pre-named tabs, make the tabs nameable, and maybe even flexible in the quantity of tabs. This would get rid of the wailing about "this tab got removed" etc. And dont get me wrong, I miss it too, in fact, I now have installers smattered around the interface for lack of a place to put them. TBH, i didnt realise it was gone as I have been so busy with working, i have not had time to play to organise things completely to my liking. and have y number of panes in each tab. so, in the config interface X,Y where X=6 and Y=3 means the 3rd pane on the 6th tab. It might be a bit of re-programming, but imnsho it should be doable depending on the schema that Nick is using now. The beauty of this idea is that if you wanted to do a d7II config *just* for installers, you would see just 1 tab, with 1 pane, with all installers listed. I agree vmhs, it would be awesome to be able to add tabs, customize the panes on the tabs, and rename the tabs. Personally, I want an OOBE tab which I will use for Audit-Mode specific tasks, and it should auto load to that tab (just like the offline tab). This tab would contain things like the Office OPK and Security Essentials OPK.